With many excellent features, the 12 Cup capacity FME2-11 Programmable Coffeemaker has a checkered history of actually delivering on the company's ambitious promises. Some cost cutting design changes have resulted in durability issues that will be obvious to loyal fans of older Krups machines, while the improvements do not always meet expectations. 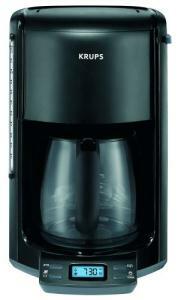 With a large easy to read blue LED readout, this coffeemaker serves as both an automatic brewing system and a clock. Overfilling the water reservoir should be avoided, since unlike many other machines it was engineered to make as much as you put in. Put in twelve cups of water, you get twelve cups of coffee. Put in thirteen and you get a mess on the countertop. Water filtration to remove that tap water taste and an automatic indicator to warn of lime buildup are standard features. A wonderful feature called Pause and Serve allows interruption of the cycle for an emergency cup of coffee. The unit can be programmed to remain hot for from one to five hours after brewing is finished. Programming is no more difficult than setting a modern digital watch--by which I mean, read and keep the manual, or consult your grandchildren for professional help. Some issues have been noted by end users. You can't reheat a pot when the cycle is finished, which is understandable--but sometimes the machines get a little mixed up about this and won't begin the cycle at all. Probably unplugging and starting over would reset the sensor (and all other settings as well). As many owners love the coffee as say it makes something that tastes like burned plastic. You may get a great deal on a fine coffeemaker, or something you have to send immediately back.